Over the winter season, snow begins to pile up all across Canada. There might not be much to be found on the west coast but the east coast definitely makes up for it. The Halifax area sees an average of nearly 6 feet of snow a year and that is a lot to sort out. 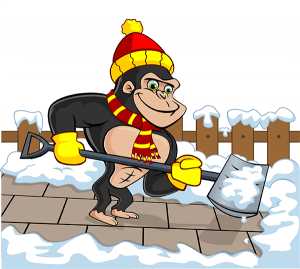 When that snow starts to build, you can trust our Gorillas to help you keep your home or business clear. Our Halifax snow removal and salting makes sure that your property is welcoming and passable for your family, friends and customers. Snow might be nice to look at, but it is no picnic to have to navigate through it. In areas like Halifax, you could end up wading through snow that is up to your chest if you do not have it cleared away quickly. Simply grabbing a shovel is one alternative for small spaces but that is only if you have the time – or ability, to do so. Luckily, our Gorillas have both! Heavy lifting has never been an issue for our experienced Gorillas, so why not let us, help you create the winter environment that you want. Bad weather is always unwelcome but it can be sneaky as well. Heavy snowfalls might strike when you least expect them, and leave you with one heck of a clean up. Instead of letting winter weather catch us by surprise, our Gorillas monitor incoming weather patterns in order to be prepared. This allows us to get ready to service residential or commercial areas with all the right tools for the job. 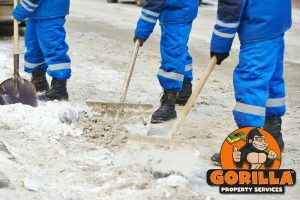 When you need the snow cleared away from your property, our Gorillas can accommodate homes, workplaces as well as multi-unit properties. Ice can be unpredictable. Even when you think the coast is clear, your boot can land on one bad patch and send you tumbling. As temperatures change, snow can melt, leaving puddles behind that freeze overnight. This can create a treacherous environment but simply throwing salt down on top of ice patches is not enough to stop them from being an issue. There is a subtle art to laying ice. If you are curious as to how our Halifax snow removal and salting works, call to speak with one of our Gorillas.